“El Estado Real de las Cosas” (The Real State of Things) is the first ephemeral installation of Guatemalan artist Mario Santizo, which requires a determined space and audience in order to fully experience it. This work is composed of eight small oil paintings, each representing a different touristic landscape of Guatemala. These include the famous Lake Atitlan as well as views of Tikal, one of the major sites of the Mayan Civilization; the arch in Antigua Guatemala, a small colonial town famous for its well preserved examples of Spanish-American Baroque); el “cerro de la cruz” (the hill with the cross), a small mountain surmounted by a christian cross, from where you can see all the city of Antigua Guatemala; Iximche, a pre-columbian archeological site where the kaqchikel kingdom used to stand; a portrait of a quetzal, the current national bird, anciently worshiped by the Mayans and Aztecs as an air god. 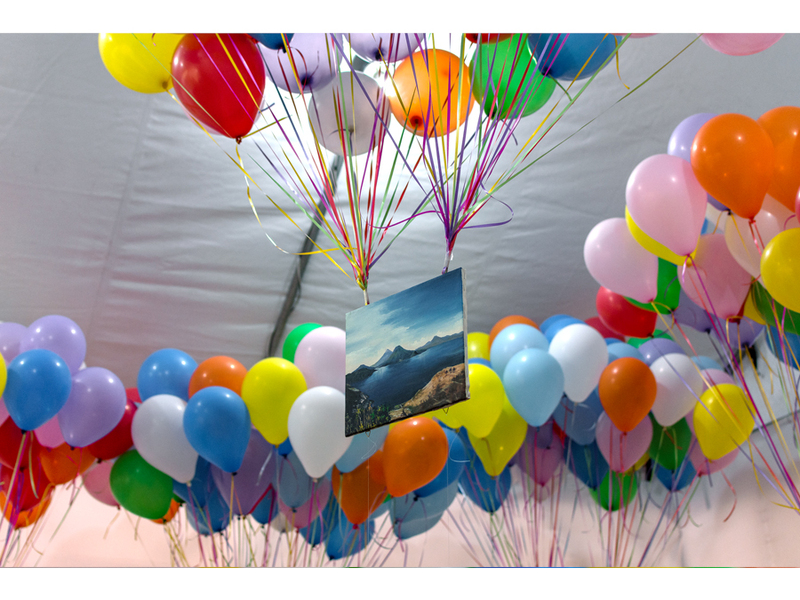 These paintings are individually hanged from 50 coloured balloons filled with helium, allowing them to float in the space for some days, before inevitably falling to the ground. These touristic destinations are part of the collective imagination not only for Guatemalans, but also for the travelers who come to visit Guatemala, mainly due to the Guatemalan Tourism Institute (INGUAT) selling these representations as those corresponding to a country with amazing nature and significant relics from different ages in history. The cultural strategy of Mario Santizo targets how Guatemala desires to represent itself, with these appealing images of a country with a lush environment and a rich cultural heritage, all despite the brutality of real life: a country where the differences between the rich and the poor are manifest and overwhelming, where basic civil rights such as public education and health care cannot be reached by the majority of the population. 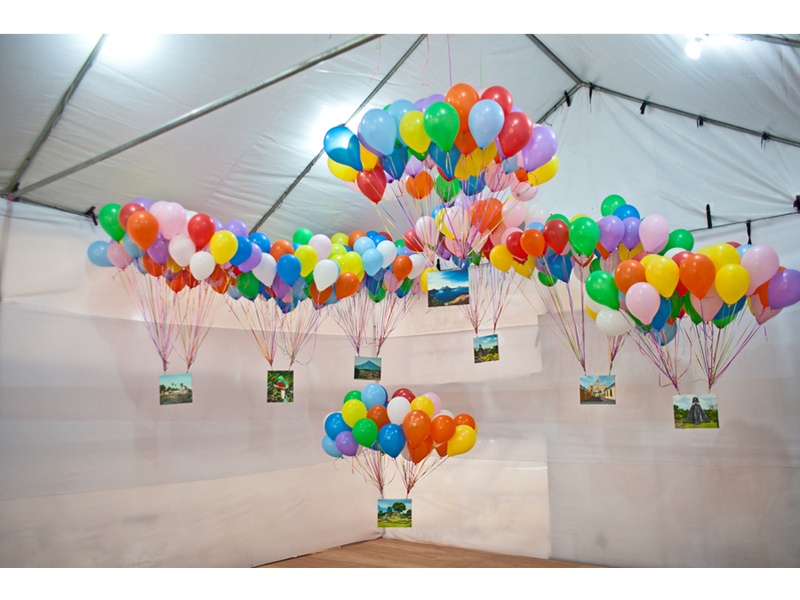 The metaphor that underlines this work –where beautiful pictures are floating in the space, hanging with colorful party balloons and subsequently falling on the ground day after day, in a sort of slow motion image– is how Guatemalans view their country, as if the mere existence pretty things meant nothing disagreeable is happening amongst them. The appearance of the nation has to be one of wellness and beauty, falling but always raising, as quoted from the national hymn: “Ojalá que remonte su vuelo, más que el condor y el águila real y en sus alas levante hasta el cielo, Guatemala, tu nombre inmortal” regardless of the vastly unequal reality. Hopefully, it shall raise in flight, above the condor and the royal eagle; carrying up to the sky, in its wings, Guatemala, your inmortal name.